The Trijicon RMR mount for Glock, simply, the most stable, reliable mounting system for your Trijicon RMR has just been developed. Rock solid stability, tested over thousands of rounds, drop tested, the only thing we haven't done, is tow a truck with it. JT Defense's new Trijicon RMR Red Dot mounting system is CNC machined from once piece billet aluminum, to fit your Glock like a glove. Hugging the slide and providing the best multi-point mounting solution on the market our new Matte Black Hard Anodized, (Cerakote available) mounting system is the ONLY mount on the market that guarantees you will never lose zero! Stop Cutting your Slides! JT Defense has developed our popular multi-point mounting system to allow the most reliable, stable mount to attach your Trijicon RMR on any Glock pistol. Our unique patent pending red dot mount, has a precision machined striker insert mounting system which is unusual in the market, because it literally locks your red dot to your slide and will NEVER move or lose zero! We invented this system years ago, as a way to attach a red dot optic to your handgun, without ever cutting or milling your slide. No other mounting system on the market, guarantees your optic will never move or lose zero. After testing our mount and Trijicon RMR over 8000 rounds, dropping testing the handgun onto hard gravel and rock from 6 feet, torture testing Glock with the Trijicon RMR mounted and still not losing zero, it is fair to say, we've created the most reliable, rugged mounting in the industry. The only other way, is sending your firearm out and having the slide machined, costing hundreds of dollars, and requiring recoating of your slide's original finish. Why not just Machine your Slide for a Red Dot optic? Well, fact is, we thought about sending our own handguns out originally before our mount was invented, but, as technology changes, the red dot sights we use today, could instantly be replaced tomorrow as new technology is released. What if you machined your slide, only to find out tomorrow that the optics industry just released a better optic, smaller, lighter weight, and you are stuck? Or ... what if you machine your slide for one brand, only to find out that you can never change to another brand mount, because the mounting is different? Example: What if you install a Vortex Venom this season, then, you wish to put a Trijicon RMR mount on your Glock next year? Well, sadly, you can't. That's because the mounting pattern of the red dots are different. So, you can never switch to another optic. This is ok as long as the company you machined your slide for stays in business.. but what if they stop making your red dot, or, if the company folds up shop? Precision Cut Striker Mount Insert: Our patent pending design, comes with a precision machined CNC billet aluminum striker insert and slide hugging top plate mount design. This kit, attaches so precisely, that our red dot mount and Trijicon RMR can be completely removed from your Glock, then fully reinstalled with minimal to no loss of zero on the Trijicon RMR red dot. This is due to the fact that our optic mount removable striker insert and mounting plate hardware are designed to critical dimensions, allowing your Trijicon RMR to be zero' once and never have to waste ammo on sight alignment again. Our mounting plate, is designed to fit the exact curves and profile of your Glock slide, and literally hugs every contour of the slide, keeping it perfectly aligned from the moment you install it the first time. The Trijicon RMR red dot, is the ultra reliable red dot, users are installing on the slide of their handgun, to provide essentially the perfect blend of reliability, fast pointing and sight acquisition and provides the shooter with the most robust, rugged and reliable optic and mount possible. Don't machine your slide! 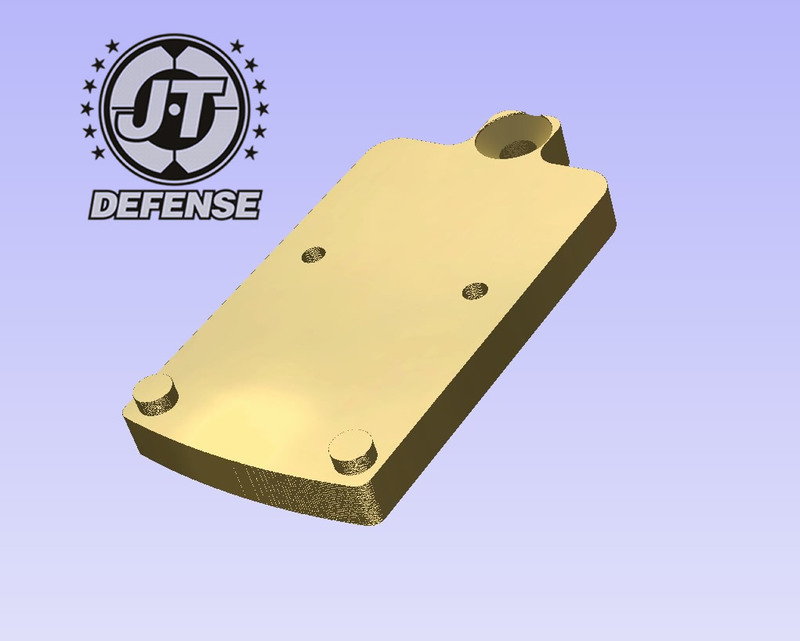 Our User installed JT Defense red dot mount, is the only mount developed, which provides multiple secure mounting locations, locking your red dot to your slide just as secure as machining, without the expense of machining, or the permanent modification to your firearm's slide. Adding a red dot, to your firearm, is one of the biggest improvements you can make to any handgun. Pinpoint accuracy is easily achieved, and the simple addition of Trijicon RMR red dot to any handgun, instantly turns a moderate level shooter, into a show-off, with simple practice. We encourage practice draw and acquisition, but anyone who has fired their handgun a few hundred times, instantly achieves fast target acquisition. Firearms are meant to last decades. Machining your slide, permanently damages the slide, and mates your gun to only one specific optic. The pin and screw pattern on most optics are different, and only fit specific optics. The only way to ever switch optic brands or vendors, is to either get the identical optic, and hope it has the same footprint, or, order the same identical optic. Well, this creates a problem. What if your red dot, which was popular today, is gone, or has changed design in 5 years and you need to replace it? You're stuck. You will either need a new slide for your firearm, or you're stuck looking for an older used optic with the same mount. What if red dots as we know it, completely change design and they're smaller? We don't know where the technology is leading, so, we highly recommend our Trijicon RMR mount for Glock, as it requires no machining and no permanent destruction or modification of your slide. Wide Slide fits Glock models 20, 21, 29, 30, 37, 38, 39.